I don’t usually post images from outside our solar system here on LITD, but this one was too good not to share! NASA’s Chandra X-ray observatory made this image of the Tycho supernova remnant, an object in our Milky Way galaxy about 13,000 light years from Earth, in the constellation Cassiopeia. In visible light it is just another star, in infrared light it appears as a bubble of red gas, but in X-ray wavelengths it becomes an exotic globular structure spanning 55 light years across, with both high- and low-energy x-rays (seen above as blue and red structures, respectively) combining to form something that looks more like a microscopic animal cell than the remains of an exploded star! The star field background is seen in optical light wavelength. One of the most important discoveries this image has provided scientists is in regards to the high-energy (blue) x-ray stripes that can be seen at the lower right edge of the structure. These are particles that have been accelerated to speeds 100 times faster than has been achieved at the Large Hadron Collider at CERN! This may prove to be the answer to how ultra-high-energy cosmic rays are produced. 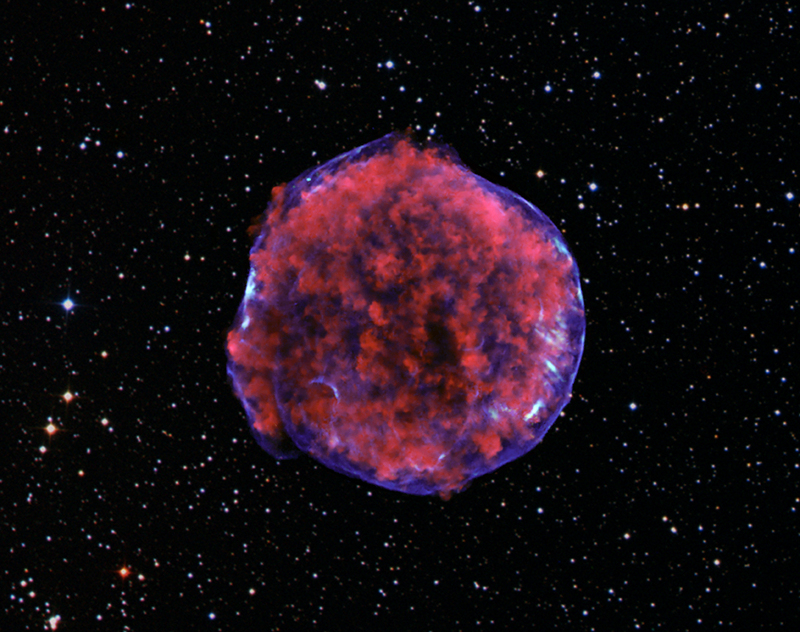 The supernova remnant is named after Danish astronomer Tycho Brahe, who reported it in 1572. It was so bright it was visible during the day without a telescope! Read more about this discovery on the Chandra imaging site here. Previous Post One Earth. One planet. One hour. Next Post First Image from Mercury Orbit!